AYX, CROX, SYNH, WING, PRAH, WIFI, FIT, HPQ, CELG, AAOI, BKNG, SQ, TDOC. In this list, BKNG and SQ stick out…but what sticks out more is a decent amount of gaps to the downside. Maybe it is nothing. We just wanted to point it out out. Our thoughts from a couple of days back that markets may have hit a near term wall is coming to fruition. So far, it is nothing more than a pullback. The only group that is really rolling over is the MANAGED CARE with names like UNH, WCG, HUM, CI, CNC breaking down. ANTM gapped up on numbers and is just pulling back. After this group, not seeing anything that looks like it…yet. The SOX should continue to be watched. They are pulling back bu notice they were down much worse during the day yesterday. Futures are hardly down on the S&P after being down markedly overnight. NASDAQ futures a little bit worse because of BKNG. Futures down a bit. We said a couple days back it “felt” like market was stalling out and may be ready for some sitting/pull back/corrective work. We are getting a little bit of it but again, it is a no biggie. Pullbacks and settling in are not a bad thing. It is actually a necessity. So we sit back and see where it takes us. Again, so far, not much. More gaps to the upside this morning. BBY, MELI, PANW, TNDM come to mind. This on top of AZO, DDS, ETSY yesterday. To be clear, it is good news to see a decent amount of strong reactions. Big gaps to the upside are very rare in bear markets. And lastly, cost estimates of the New Green Deal are between a measly $53 trillion to over $90 trillion over 10 years. We think these numbers are low because it does not account for an economy that would go into the s—-ter. This would certainly raise the costs for this fantasy land nonsense. We will continue to be one of the biggest voices against these authoritarian dictators that want to run the world. They want to run your life. Tell you what to eat, what to drive, what to believe. They want you to believe they are altruistic but there is no altruism in power and control. They tell you higher taxes are to help others but they dont tell you that for every $1, maybe…just maybe 10 cents remains after all their bureaucratic nonsense and their payoffs to people who bow down. Just notice they will not tell you cost. They will not tell you how. They will just tell you the rich and successful are crooks, billionaires are immoral and people are poor because others are rich. We also want you to notice that all of these people have never run a business, created a dime of wealth and have actually not a clue how things work. More to come. We stated on radio yesterday that we thought we were hitting a short term wall. This was based on sentiment going coast to coast but also lots of tails to the downside yesterday off of very extended short-term conditions. We must tell you a pullback/correction/sitting would be terrific at this point. It sets things up better, pulls in things better and gets the bulls a little worried. At his juncture, we do not believe any pullback would be troublesome but more controlled. Of course, that can always change and will let you know. There are a bunch of names that had strong gaps and moves off of earnings and will be watching them to see how they act in here. Gaps this morning…AZO with a big gap even though sales flat. THC, DDS, HTZ, MOS and MNK are up. HD not helping the cause down over $6…a Dow name. Also, TREE, MEDP, SHAK are down. We are back home from our 11 day trip to Israel and Jordan, our 2nd time to Israel and 1st time to Jordan. We visited Petra, Jordan on a day tour. Petra “is a famous archaeological site in Jordan’s southwestern desert. Dating to around 300 B.C., it was the capital of the Nabatean Kingdom. Accessed via a narrow canyon called Al Siq, it contains tombs and temples carved into pink sandstone cliffs, earning its nickname, the “Rose City.” Perhaps its most famous structure is 45m-high Al Khazneh, a temple with an ornate, Greek-style facade, and known as The Treasury.” Words to do not do this place justice. It is a marvel. For a few pictures and video, check out my twitter feed. We were picked up in the southern Israeli beach city of Eilat and was transferred across the border. (There is a big wall along the border!) It was about a two hour drive to get to Petra. As you walk through the canyons, you will not believe what you are about to see. A true wonder of the world. We explored Jerusalem and Tel Aviv again. We found new things to see. Even walked into Fox News’ Pete Hegseth who was filming a documentary in the Old City. Speaking of Fox, the people of Israel love Fox and Fox Business. Both were on in every hotel we stayed at. We did not even have to demand Fox Business. Little ole under the radar me was recognized by several locals. This was a thrill. What is not talked about enough is how every race, creed, color, religion, gender…you name it, work side by side, play side by side and live side by side in peace. You would never know it by some of the crap you read here. We visited Masada again, the Dead Sea, the Red Sea, Sea of Galilee, Tiberias, Jaffa, Jericho and yes, we went into Hebron where we are told it is considered the most dangerous of places. We felt safe though we must say there was quite the presence of military. We were gone for 7 trading days. In a nutshell, IMPROVEMENT AND A CONTINUED CLEAR LACK OF SELLING. Since we left, we continue to see absolutely no institutional selling. We had a small down day or two but after the rally off the lows, one would expect retracements…but ain’t happening. It has been persistent. It has been improving. More and more areas have turned the corner. We continue to be asked how this can be happening when so many data points on the global economy have been heading south and when overall earnings and sales have decelerated. It remains a simple equation. Just go back to January 4th when we came off our bearish stance. We came off our bearish stance because how extremely stretched things were but the main reason was because for 10 years, every time the “easy money” was either talked about or put into place, markets stopped going down and turned up. January 4th was the day Powell completely changed his stance because of the pressure from the White House and because of human nature. Human nature says most of us want to be popular. With Powell’s popularity on Wall Street just south of root canal, with Mnuchin and the President in his ear, it was time to get popular again. And change he did and change the market did. We also have to add that Trump did exactly what we thought…stopped any more tariffs. We also have to add China is easing like Bernanke did. We also have to add Europe and Japan have all but announced more easing and yes, we also have to add that there has now been discussions at our maniacal fed that they could consider more printing of money even without an emergency. Look no further than all of us as to why markets are behaving so well. Not only has the market been improving but some of the earning’s reactions have been downright amazingly strong. Symbols like TTD, INTU, OLED come to mind just from Friday. A bunch of other names also gapped nicely on their numbers. About the only negative we can say about the market right now is that sentiment has now gone coast to coast with things getting frothy already. Wall Street does have a short memory. We would like to say things will get tricky as we continue to head into massive resistance but so far, resistance has been a non-event. 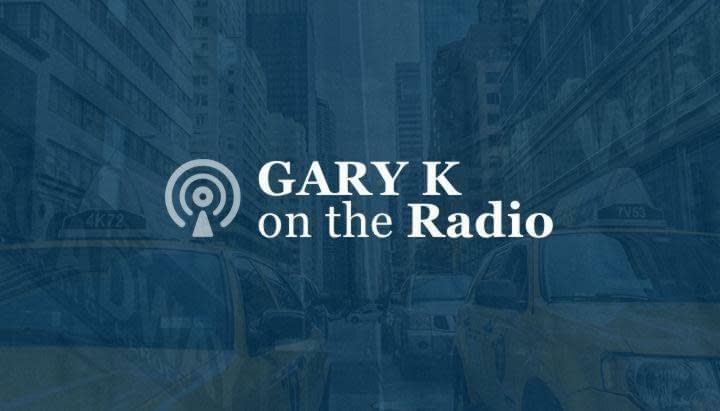 http://garykaltbaum.com/wp-content/uploads/2015/11/GaryK-RedTie-Head-Shot01.png 630 1020 Gary Kaltbaum http://garykaltbaum.com/wp-content/uploads/2019/01/gary-k-logo7-01.png Gary Kaltbaum2019-02-25 07:28:482019-02-25 07:28:48BACK HOME!